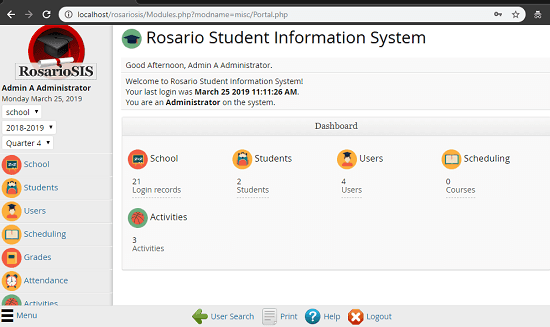 RosarioSIS is a free self hosted student information system for school management. If you have a school then you can install and use this school management system on your server. With this, you can manage student data in your school along with data of teachers, and other administrative staff. It comes with features like grade management, attendance management, billing, activities, food services, and many others. You just have to configure it once and it will be ready forever. We have covered some school management systems before. This one is similar but some with some more features. A very little technical knowledge is required to install this and get it running. There are separate interfaces for students and staff. 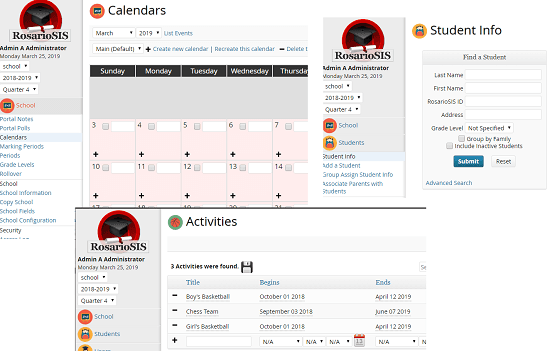 For students, it shows details for the activities, schedules and grading information. But from the staff or teacher account, you can access and edit some advanced modules such as attendance details, search a specific student, add, remove a student from the database and much more. Grades Management: In this school management system, if your role is of a teacher then you can manage grades for students. You can see grades of any student, see grades breakdown, calculate GPA, and see class rank list. All the options are available in the grading section of the tool. Attendance Management: It offers different modules for managing attendance of students as well as attendance of teachers. You can explore the attendance log and add new attendees as well. It offers you an attendance chart to visualize the overall attendance and you can demand absence summary too. Activities Management: All the extracurricular and other activities which have been planned for the academic year can be listed in the Activities section. You can create an activity by adding its name, date, time, and venue. It will automatically appear on the calendar of students on their corresponding portal. Moodle Integration: This school management system comes with Moodle integration. With this, it creates events and assignments automatically. You can also automatically drop or schedule students from a course period. Accounting: In the accounting section of this school management system, you can manage the salaries of teachers and other school expenses. You can see the current balance and print statement reports. In addition to that, there is a daily transactions tracker for administration department. Food Service: In case, your school provides food facility then you can keep track of the meals. In the Food Service section, you can manage the food items, menu, served meals, daily transactions, and some other related parameters. Responsive Interface: This school management system is mobile responsive and you can access it on a desktop, mobile, and on a tablet device very easy. How to Setup this Student Information Management System? To setup this student information system, you need a web server software with at least PHP 5.5. And it uses PostgreSQL database. So, make sure that PostgreSQL instance is running and you have access to it. 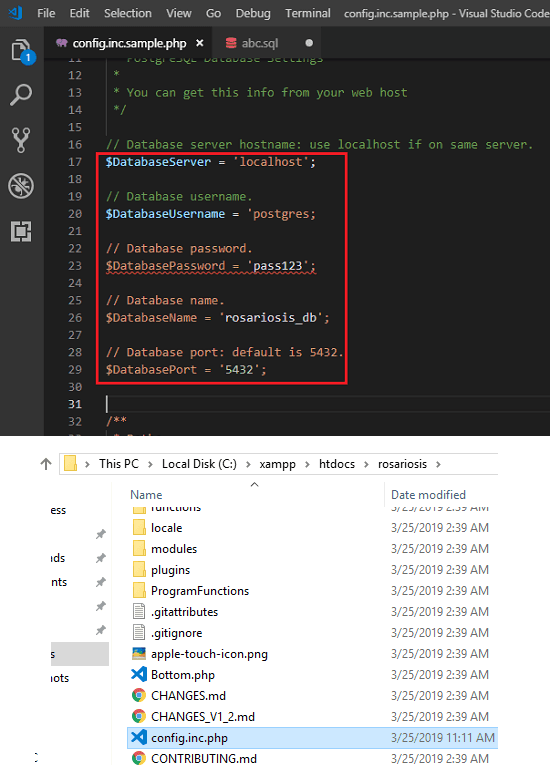 In the PgAdmin, create a new database as “rosariosis_db” and then run the SQL file that comes with it to create the schema. In addition to this, you will also need to install Wkhtmltopdf which you can get here. For the web server, I will be using XAMPP which you can get from this URL. After doing this, simply follow these steps. Step 1: Download the repository of RosarisOS from the GitLab or simply git clone into htdocs directory. After that, open the file “config.inc.sample.php” and specify the database credentials and other required variables. After adding all the information, save file as “config.inc.php”. Step 2: Now, if the PostgreSQL support is disabled in your PHP configuration then simply enable it. 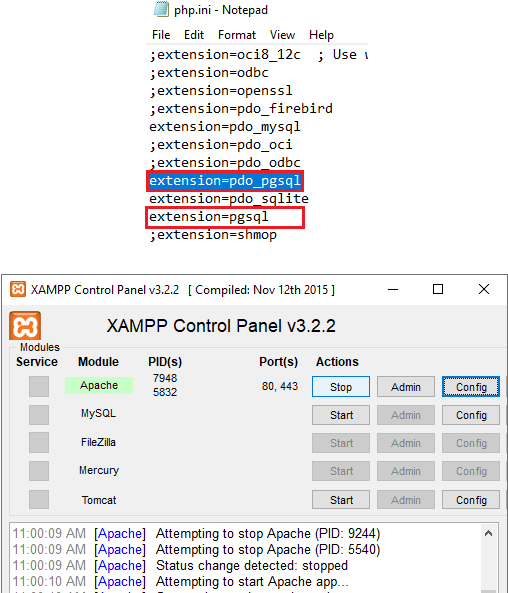 In the “php.ini” file, remove the semicolon from from the “;extension=php_pgsql.dll” or “;extension=pgsql.dll”. Next, save the changes and start the server. Step 3: Point your browser to “localhost/rosarioSIS/index.php” and the login page will appear. Enter the default login and then you will reach the main interface of this student information management system. Step 4: All the components of this school management system are listed on the sidebar. You just select anyone from there and then proceed with the corresponding information. 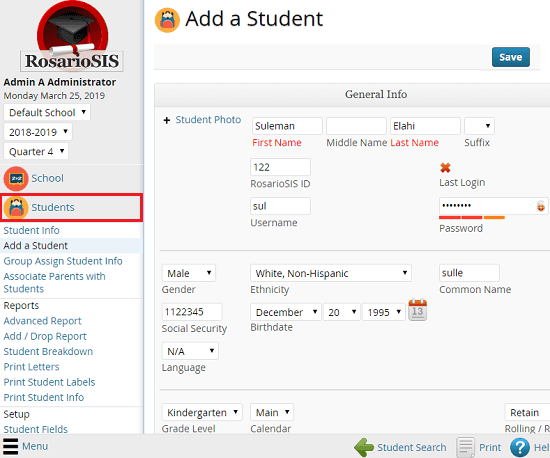 Step 5: In the beginning, you will have to update the school information and then start adding students in school database. Use the “Students” section to add new students and search and existing student. During student creation, you can opt to specify the its username and password as well so that he can login in the student system. Step 6: Similarly, you can manage other options in this information system. You can manage attendance, accounting information, and other features of this student management system. In this way, you can use this student information system. You can run it locally and on other platforms which it supports. Though, there are some external dependencies are required but they are easy to take care of. You just configure it once and then use it for as long as you want. Initially, there are 3 users only but you can add other users and specify their roles. 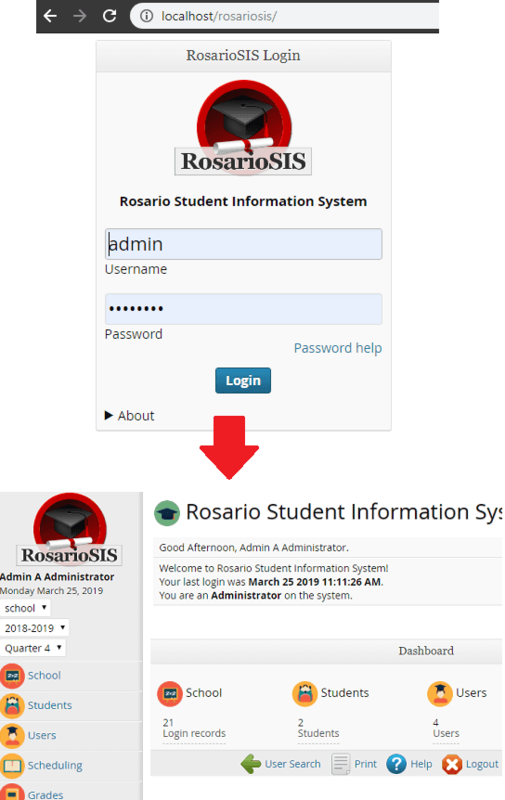 RosarioSIS is simple and easily maintainable student information system that you can use for school management. I really liked it for its simplicity and having all the features that you need to manage a school. However, I don’t think it is good for managing for very large school as in case of failure; you may suffer huge data loss. For small school such as up to 8th grade, it is very nice. And you don’t need much technical knowledge to install this. So, if you are looking for simple and powerful school management system then I will suggest you this one. And this post will help you in installing and configuring this on your own server.